A U.N. official said Libya's new rulers had found uranium yellowcake, partly refined uranium ore, that was left over from the former regime's nuclear program, in a southern area. The official, who spoke on condition of anonymity because he wasn't authorized to release the information, said Thursday the material was "slightly radioactive" but posed no immediate danger. He didn't know how much had been found. British newspaper The Telegraph reported that at least 10,000 drums were found at the stockpile but they haven't been examined. The Vienna-based International Atomic Energy Agency confirmed that yellowcake is stored in drums at a site near Sabha, which had been disclosed to the nuclear watchdog. The IAEA has tentatively scheduled safeguard activities at this location once the situation in the country stabilizes, according to spokeswoman Gill Tudor. The U.S. ambassador to Libya, Gene Cretz, said Americans were worried about the proliferation of weapons that were missing from Muammar Qaddafi's once vast arsenal. In particular, the U.S. has sought to keep track of Libya's unconventional weapons experts during the civil war. Qaddafi agreed to dismantle his weapons of mass destruction research and production programs as part of efforts to normalize relations with the international community as he faced intense economic pressure from international sanctions. But he never completed the process. 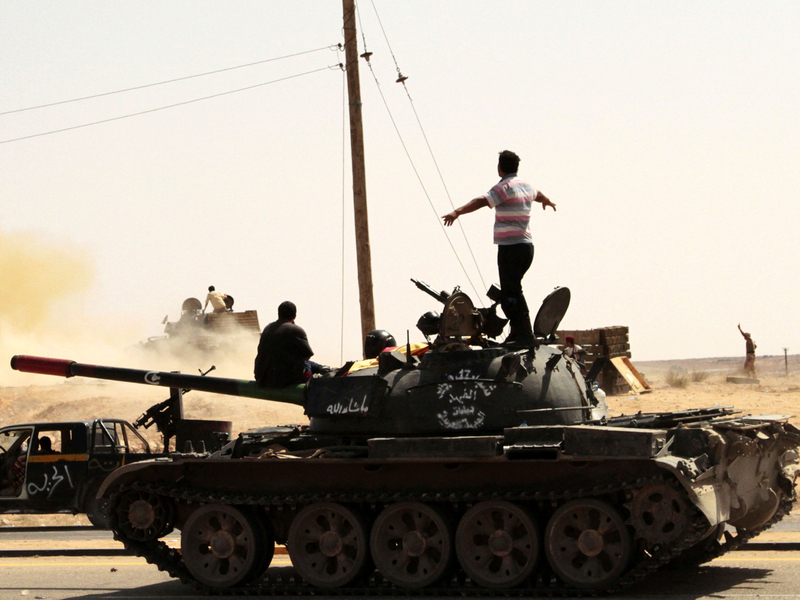 Also Thursday, fighters from Misrata said in a statement that they are in control of chemical weapons near Qaddafi's hometown of Sirte  one of the three areas where loyalists continue to put up stiff resistance. They said they are safeguarding any possible chemical weapons until the arrival of a U.N. team, which will oversee their transfer. "We are looking for a peaceful country and we don't want these kinds of weapons to stay in it," the statement said. On Monday, NATO said warplanes have struck several military targets in Sirte as Libyan revolutionary forces besieged the area in an attempt to wear down Qaddafi loyalists. The alliance said that it hit eight targets around Sirte Sunday, including an ammunition and vehicle storage facility, a multiple rocket launcher and other military sites. Revolutionary fighters have faced fierce resistance in efforts to take the city and the NATO airstrikes could be aimed at softening up targets for a new push in coming days.